Like many of you over the weekend, I was glued to my television, watching golf again and wearing red, and not because of Palm Sunday. There was Tiger Woods, who after enduring nearly a decade of both physical and emotional debilitation, not to mention the shroud of shame and scandal, was Sunday’s leader again. It took me back 22 years—nearly a generation—when we all first saw a 21-year old Tiger roar through Augusta National in 1997 and leave the 18th hole a Masters champion for the first time. All the world seemed fixated on his hug with his late father, Earl Woods. This time, it was Tiger and his kids. But the hug I wanted to see back then and now was that loving, cleansing victory hug from his mom. Tida Woods, a Thai immigrant, has always been the Tiger story for me. She’s been the reminder for all the world that Tiger Woods is one of us. Just look at him. There’s something about Tiger Woods that’s plain to see: He’s a tanned Asian! If he keeps his hat on, he looks kind of—Filipino! Normally there’s a tendency to see ourselves in the hero of the day. But in this case he really is. He’s half Asian American. Why can’t other people see the Asian in Tiger? Why is he consistently seen as the “black” golfer? Maybe it’s because some people refuse to stop looking in yesterday’s mirror and choose to ignore the changing reflection of our society. With Tiger’s emergence, the unbearable truth for some is that he’s not just changing the way we look at golf. He’s changing the way we understand the issue of race. Not only is he breaking golf records—he’s breaking old race paradigms. Through him, we’re all beginning to understand that the world isn’t just black and white anymore. That fact alone gave the media fits over the weekend. After he won, reporters and editors seemed incapable of capturing the essential part of Tiger. Great golfer, sure. But what is he? What do you call him? Credit CBS broadcaster Jim Nantz, who during the post-game interview, caught himself in mid-sentence when he asked Woods how it felt to be the first “African American” Masters champion. The broadcaster quickly added, “Asian American,” to his question. Nope. It’s only a matter of accuracy. In fact, “multiracial” would have worked. But most news editors resist terms like that. To them, the world hasn’t changed since Jackie Robinson. Twenty-two years later, and there was no mention of race at all. The green jacket and his red mock turtleneck were the only colors I heard mentioned. Woods is just ethnically Tiger. Nor was there a reference to the National Enquirer stories back in 2009 that gave us a different picture of Tiger, the human, venal side, prone to infidelity. There was talk of his physical pain from golf, and how it was thought he would never walk again, let alone strike a golf ball. “Never give up, that’s a given,” Tiger said at the news conference, who seemed humbled by what had transpired. He said luck played a role as the tourney could have gone any way in the final holes. “You just hang in there and persevere,” he said. So maybe that’s the lesson, or lessons, for 2019. It’s how a fallen hero pieces himself back to do the thing that made him unique and the best in all the world once again. It’s how the promise he showed in 1997 is not lost. America may not have fully embraced diversity quite like we expected. And a backlash has emerged, led by a man Tiger’s played golf with a few times, the Mar-a-Lago resident who lives in the White House. But America is slowly coming around. There’s something karmic about the Woods story occurring on the anniversary of Jackie Robinson’s breakthrough presence in baseball. It’s barrier breaking for sure. But it’s just different enough. Robinson fit the simplicity of innocence for the ‘50s. Then it was just a matter of inclusion. With Tiger, the issues go beyond mere inclusion. They involve acceptance, respect, and certainly in Tiger’s case, acknowledgment of our excellence. He’s the perfect symbol for the racial complexities of the next millennium. It’s the era of Tiger Woods. The old game won’t work. And neither will the old labels. As the first person of color to win the Masters, he’s diversity’s champ. As far as the new race reality, we’re getting there. Slowly. And like Tiger’s comeback from scandal and pain, he’s proof you can transcend it all and be a hero again. In the middle of the final round, a female friend showed disdain—an unwillingness to forgive Tiger for his sordid past. But I told her why judge Tiger? He’s not Louis C.K. Or Donald Trump even. Let us all–Tiger fans and detractors alike–take a cue from Tida. Tiger’s mom is no Tiger mom. 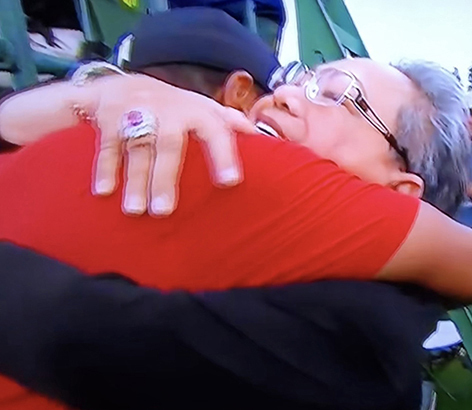 On the 18th hole of the final round of the Masters, she showed her approval with what only a mother can provide– a cleansing, loving victory hug.